Lawn care has been our top priority since we were founded in 1997 as Omaha’s complete professional lawn care service and lawn fertilization company. We provide Omaha professional lawn care services for both commercial and residential properties including: our 6-step lawn fertilizer services, mowing services, natural stone landscaping, landscape design and installation, lawn aeration, and lawn over seeding. We always use only the highest-quality landscaping supplies and landscaping products to ensure that your project lasts for years to come. Take the “work” out of yard-work and let the Omaha landscaping professionals at H&H do it for you. Contact us today for your residential or commercial lawn and Omaha landscaping needs at 402-916-9500. Full service professional lawn service, maintenance and analysis. Rest easing knowing you’re receiving the best lawn fertilizer for your yard. Start the warmer months off right by giving your yard the nutrients and care it needs to stay lusciously green and healthy throughout the growing season. Proper spring lawn care starts with our 6-step lawn fertilizer service to strengthen the roots of your lawn and prevent any weeds from spoiling its beauty. Our lawn fertilization process lasts from spring through fall so you’ll know we’re providing the best lawn care service possible. H&H Lawn & Landscape provides lawn care maintenance and yard fertilization programs for Omaha, NE and surrounding communities. We will customize a lawn care program to suit your needs. It can range anywhere from weekly trimming and mowing to a complete grounds maintenance program for your Omaha property. H&H Lawn and Landscape provides lawn care maintenance and yard fertilization programs for businesses in Omaha, NE and the surrounding communities. Our team of Omaha landscapers will customize a landscaping project or lawn care program to suit your business’ needs. Our commitment to quality is evident in every project we handle. Whether we are mowing, fertilizing, pruning, building a natural stone retaining wall, or installing a one-of-a-kind paver patio, we believe each job is worth doing well, with the best landscaping supplies. 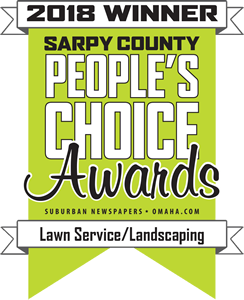 We value our Omaha area customers and feel they deserve the best in professional lawn care and landscaping. We strive to deliver the highest quality and customer satisfaction.